A large-scale exhibition of tomb-wall paintings jointly organized by Shanghai Museum and Shanxi Museum was opened in Shanghai recently. 89 pieces of tomb-wall paintings collected by the Shanxi Museum is on display in Shanghai Museum, which makes it the largest ongoing exhibition of the original mural art in China at present. Visitors can see ancient tomb-wall paintings from the Northern Dynasty (439-581), Song, Jin and Yuan dynasties (960-1368), most of which have never been displayed outside of Shanxi Province. 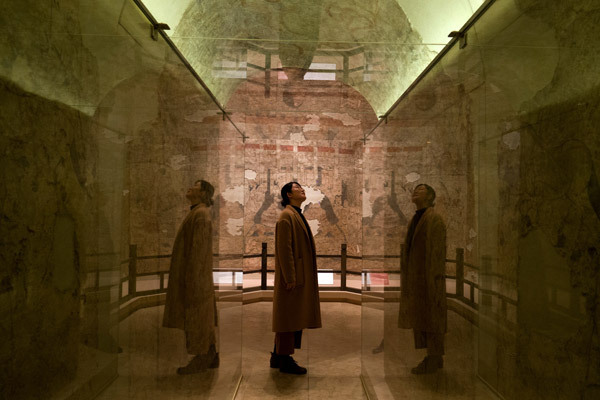 To ensure the best viewing experience and the protection of the wall paintings, a glass corridor with an LED-lamp system has been installed, allowing visitors to examine the wall paintings as if they were on the ceilings and the walls of a tomb. Shanxi, a birthplace of Chinese civilization and a melting pot of diverse cultures in ancient times, is home to more than 225,000 ancient wall paintings, some of which are in ancient tombs. According to Zhang Yuancheng, curator of the Shanxi Museum, the museum now boasts a collection of nearly 1,000 square meters of tomb murals. And the exhibition at the Shanghai Museum, which took three years to prepare, features "the cream of the collection". The exhibition will run through March 4. There is also an online exhibition at the Shanghai Museum's website, which displays the wall paintings, the process of discovery and restoration techniques through videos and pictures.